Guineafowl (/ˈɡɪnifaʊl/; sometimes called , "pet speckled hen", or, "original fowl" or guineahen) are birds of the family Numididae in the order Galliformes. They are endemic to the continent of Africa and rank among the oldest of the gallinaceous birds. They are phylogenetically intermediate between peafowl and the Odontophoridae. One Eocene fossil lineage, Telecrex, is represented by the black guineafowl, an extant species native to the primary forests of Central Africa. Telecrex, which inhabited Mongolia, may have given rise to the oldest of the true Tetraophasianids like Ithaginis and Crossoptilon, which evolved into high-altitude montane adapted species with the rise of the Tibetan Plateau. While modern guineafowl species are endemic to Africa, the helmeted guineafowl has been introduced widely elsewhere. This is a list of guineafowl species, presented in taxonomic order. 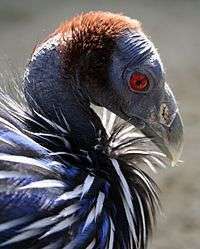 The insect- and seed-eating, ground-nesting birds of this family resemble partridges, but with featherless heads, though both members of the genus Guttera have a distinctive black crest, and the vulturine guineafowl has a downy brown patch on the nape. Most species of guineafowl have a dark grey or blackish plumage with dense white spots, but both members of the genus Agelastes lack the spots (as do some wild variants of the helmeted guineafowl). While several species are relatively well known, the plumed guineafowl and the two members of the genus Agelastes remain relatively poorly known. These large birds measure from 40–71 cm (16–28 inches) in length, and weigh 700–1600 grams or 1.5-3.5 pounds. Guineafowl travel behind herd animals and beneath monkey troops where they forage within manure and on items that have fallen to the understory from the canopy. Guineafowl play a pivotal role in the control of ticks, flies, locusts, scorpions and other invertebrates. They pluck maggots from carcasses and manure. Wild guineafowl are, without exception, strong fliers. Their breast muscles are dark, enabling them to sustain themselves in flight for considerable distances if hard-pressed. Grass and bush fires are a constant threat to these galliformes and flight is the most effective escape. Guineafowl species are found across sub-Saharan Africa, some almost in the entire range, others more localized, such as the plumed guineafowl in west-central Africa and the vulturine guineafowl in north-east Africa. They live in semi-open habitats such as savanna or semideserts, while some, such as the black guineafowl, mainly inhabit forests. Some perch high on treetops. The helmeted guinea fowl has been introduced in East Africa, the West Indies, the United States, Britain, and India, where it is raised as food or pets. Guineafowl meat is drier and leaner than chicken meat and has a gamey flavour. It has marginally more protein than chicken or turkey, roughly half the fat of chicken and slightly fewer calories per gram. Guineafowl eggs are substantially richer than chicken eggs. Wikimedia Commons has media related to Numida meleagris.